It sounds like the start of a bad joke: an Englishman, an Irishman and an American. This multi-national trio, however, are not walking into a bar, but are instead chained to the wall of a gloomy basement in Lebanon, indefinitely imprisoned by their captors and faced with the all too likely prospect of their own execution. Actor Robin Soans summarises the situation succinctly when he describes the feelings of his character, Michael: “It seems to him that he has awoken in hell”. This is the premise of Frank McGuinness’ Someone Who’ll Watch Over Me, a play written twenty years ago about the hostage crisis in Lebanon that was then just coming to a close, and which is now being revived by Red Handed Theatre Company and the Southwark Playhouse to coincide with the anniversary. As I chat to the cast in their dressing room at the atmospheric, dungeon-like space under the arches of London Bridge station, Soans admits with a laugh that “you couldn’t find a better space in London to put it on”. 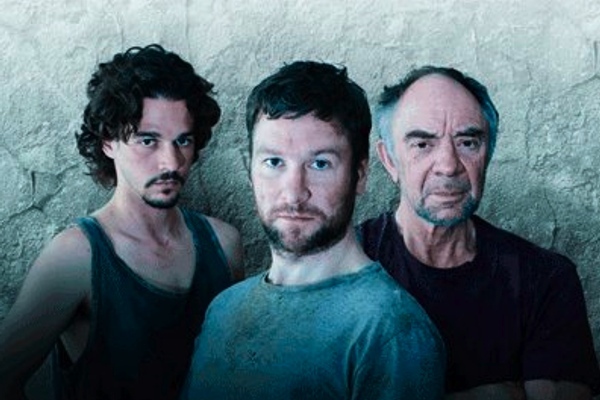 While the action of the play may be rooted in the hostage crisis that gripped Lebanon between 1982 and 1992, during which 96 individuals from a range of different, mostly Western nations were kidnapped and held in captivity, McGuinness’ image of three men trapped in an impossible situation is more notable for its universal resonance. This might, as the actors discuss, be any extreme situation in which the human spirit is pushed to its outer limits. It is the ways in which these three characters deal with their imprisonment and the truths about humanity that emerge through this that provide the true pull of the piece. “Anyone watching the play could identify with the struggles that these characters go through,” explains Joseph Timms, who plays American captive Adam, the hostage who has been imprisoned the longest of the three. Soans, whose character Michael is an English academic who enters the mix after the other two, agrees: “It’s a universal play and there are situations like this all over the world all the time, even in domestic situations, where people feel locked in or hemmed in”. It does not matter all that much whether these characters are in a makeshift cell in Lebanon or a prison on the other side of the world; what really matters is how they cope. It is perhaps surprising to learn, as third cast member Billy Carter, who is playing Irishman Edward, tells me, that “the script is heavily layered with lots of humour”. Humour, along with improvisation, role-playing, music and debate, becomes a vital survival mechanism for the three men trapped alone with nothing but their thoughts and one another. Soans emphatically describes laughter as “the greatest tool for survival”, adding that if you don’t make jokes about a hopeless situation “you just collapse, you deflate”. As Timms chips in, “the worst thing to do is to give in and to cry”. Although the tedium of imprisonment is punctuated with the jokes and play-acting of McGuinness’ script, any production of this play is physically limited by the very situation in which it is staged, with the actors only able to move as far as their chains will allow. This must have been a challenge to keep the performance feeling dynamic? “It doesn’t feel like a static play at all,” Soans protests. “Physically, yes, it’s quite confined, but in every other sense it’s very fluid.” Timms, meanwhile, compares the confined energy of the three men that the actors explore on stage with that of a chained, unpredictable animal. As Carter goes on to explain, there are tonal shifts between scenes that help to break it up, shifts that director Jessica Swale has used to propel the action forward. Speaking about the dialogue, Carter says, “it’s so sparky and as actors we’ve hit a beautiful rhythm. It’s like a dance.” Continuing the musical analogy, the actors describe each scene as having its own key that needs to be hit, creating something of a challenge for director and cast. To ensure that the necessary precision is achieved, I am told that they have used a method of ‘actioning’ in rehearsals, assigning a transitive verb to each line, which Soans explains was an invaluable process because of the “mercurial” nature of McGuiness’ script. Also central to the dynamic of the piece is the relationship between the three very different characters, who are thrown together against their will and must learn to support and respect one another in order to survive. Soans describes it as a “pressure cooker version” of any close relationship where people must become accustomed to and absorb one another’s quirks and irritating habits. Such essential, intense relationships demand an atmosphere of collaboration and generosity among the cast, an atmosphere that was actively nurtured by director Swale. This is not a play in which any actor can afford to be greedy. The result of this closely collaborative effort is one that is intense for both cast and audience. Timms describes the experience of watching this play as that of “watching a human struggling against an inevitability or a darker evil, which we all have in our lives, and we all fight against it and think we’re alone in having to deal with it, but then when you see it on stage it actually gives you a comfort and a strength. It gives you a joy in being alive.” The true aim of McGuinness’ play, at least as the cast see it, is to share something about what it means to be human and the mechanisms that human beings use in order to survive in desperate situations. Contradicting those who would dismiss the arts as a waste of public money, Soans continues in the same thread as McGuinness by asserting that “drama is absolutely integral to the human spirit”, an assertion that is heavily supported both by the play and by the true accounts of hostages that have informed it. “A number of people left alone will sooner or later make a play,” Soans goes on, “because they want to explore themselves and their predicament. We want self-knowledge, and one of the best ways to get self-knowledge is through drama, through making a paradigm of something similar to your situation”. Throughout our conversation, what reveals itself as the dominant, uplifting theme of McGuinness’ work, and what has ensured that it remains as relevant and resonant today as at its conception twenty years ago, is the indomitable and endlessly imaginative nature of the human spirit. The play also convincingly positions itself as an argument for the arts, not just as a decorative addition to human life, but as an integral part of our existence. As Soans puts it, with a slight note of triumph, “it’s a very good justification for theatre”.